For a while, it looked like ASUS' Transformer Book would turn out to be vaporware: after debuting to much fanfare a year ago, it encountered numerous delays, and even missed the crucial holiday shopping season. Now it's finally here, priced at $1,499 with a Core i7 processor, a 13.3-inch (1080p) screen and a detachable keyboard dock housing both a spare battery and a 500GB hard drive. The problem is the timing: Intel is about to launch its new Haswell chips, and here's the Transformer Book, arriving on the scene with a lofty price and a year-old CPU. It'd be easy enough to tell you just wait for a refresh, which is how we've been ending all of our PC reviews in the weeks leading up to this year's Computex. But it's still worth investigating whether the Transformer Book (aka the TX300) is a compelling idea. Though we've seen many tablet hybrids (the Surface Pro, etc. ), they've mostly had smaller 11-inch screens. So what happens when you take that form factor and stretch it to accommodate a bigger screen -- and a more spacious keyboard? And how does it compare to all those convertible options out there, like the Lenovo IdeaPad Yoga 13 or the Dell XPS 12? Let's have a look. The Transformer Book was an innovative concept when it was first announced a year ago. But now that it's finally shipping with old components, you're better off waiting for a possible Haswell refresh. How would you rate the Transformer Book? The Transformer Book is, at its heart, a mashup between a laptop and a tablet (a very big tablet, we might add). So it makes sense that it looks like the lovechild between ASUS' Zenbook Prime Ultrabooks and its various Transformer products. The tablet itself has the same spun-aluminum back as the Infinity tablet, done up in a familiar dark grey. 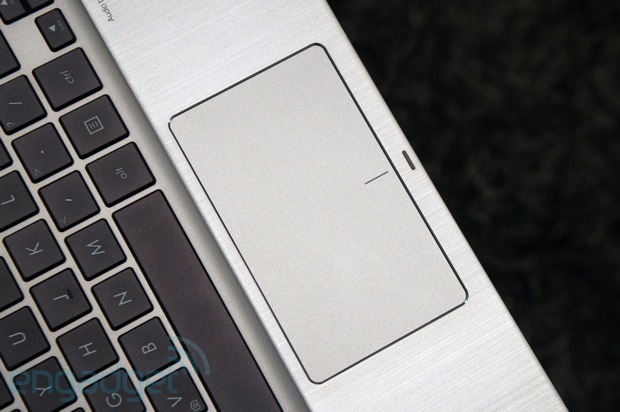 Meanwhile, just like last year's Zenbook laptops, the keyboard dock takes on a pale champagne color, which carries over to both the main deck and the back side. Basically, then, it's a two-tone, black-and-white cookie of a notebook, with dark metal blanketing one half and a lighter material covering the bottom. It's an unconventional choice, but it works. How often are you going to use your 13-inch Ultrabook as a tablet? Once we reacquainted ourselves with the familiar design language, we started to realize how heavy this thing is. In total, it clocks in at approximately 4.2 pounds -- considerably more than other 13-inch touch machines -- with the tablet and dock each weighing in at 2.09 pounds. It might seem odd that the dock weighs as much as the tablet, but consider this: the keyboard houses both a 3,200mAh battery and a 500GB hard drive to complement the 128GB SSD inside the tablet. (HP's 13-inch Split x2 hybrid has a similar setup.) Likely because of these added features, the Transformer Book's keyboard accounts for much of the total thickness as well: the two together measure a fairly plump 0.92 inch thick, but the tablet itself is only 0.4 inch. That's not bad at all considering there's a frickin' Core i7 processor inside, along with a fan to help keep it cool. That said, you'll probably be most impressed with the Transformer Book if you intend to actually use it in tablet mode. As a standalone slate, it weighs considerably less than the 3.3-pound Yoga 13 or the 3.35-pound Dell XPS 12. Relatively speaking, it's more comfortable to use, though it's still a little unwieldy. And as a laptop, the Transformer Book weighs more than either of those machines. A lot more. And you have to wonder if it's worth it. 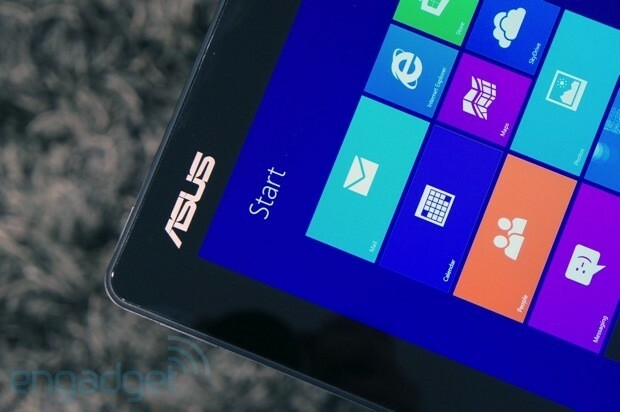 How often are you going to use your 13-inch Ultrabook as a tablet? And is it really that important that your PC take on the same form factor as an iPad or an Android tablet? Both the Yoga 13 and XPS 12 have hands-free tablet modes, and they make room for big keyboards too. It would seem to us that leaves one, maybe two good reasons to go with the Transformer Book: you want the spare 500GB hard drive, or you like the idea of having a spare battery. Otherwise, there are other form factors that accomplish the same thing as the Transformer Book, albeit with a greater emphasis on the laptop piece. Moving on with our tour, that fan sits on the back edge of the tablet, right below the 5MP / 1080p rear camera. (No LED flash, sorry.) Around back, you'll also find dual speakers, with one grille on each end. Holding the tablet in landscape mode, you've got the volume rocker on the left side, along with a micro-HDMI socket and a headphone jack. Over on the right, there's an exposed microSD slot. On the bottom, obviously, are all the docking connectors that latch into the keyboard. There's also a proprietary charging port down there, which you'll find mirrored on the dock as well. Naturally, a common connector means you can use the same cable to charge both devices, and at the same time, even. Finally, the power / lock button is on top, just where you'd expect it to be. Interestingly, you don't have to hold it down to turn the device on, as you would with a real tablet; this really is more of a laptop without a keyboard. That about covers everything you might need in tablet mode. The dock, meanwhile, is home to (almost) all the ports you could possibly want in a laptop (and yes, that includes an Ethernet jack). In addition to that wired connection, there's a full-size SD card reader, two USB ports, mini-VGA and a DisplayPort. The only thing missing is HDMI, but fortunately there's a world full of adapters you can buy if a simple TV hookup is what you're after. Finally, you'll probably be interested to know what comes in the box. For starters, you get a simple black carrying case, along with two dongles: USB-to-Ethernet and mini-VGA-to-VGA. ASUS has been throwing in these sorts of extras for years, as any loyal customer will tell you, and we're glad the company is keeping it up. If you've owned or even played with a Zenbook Prime before, you know what to expect with the Transformer Book: it has basically the same backlit keys as ASUS' earlier offerings (everything after the original UX31, anyway). For some time now, these keyboards have had plastic, not metal, buttons, with a good deal more travel than they used to. In fact, the company slightly adjusted the key travel this time around, making that the only change over previous models. 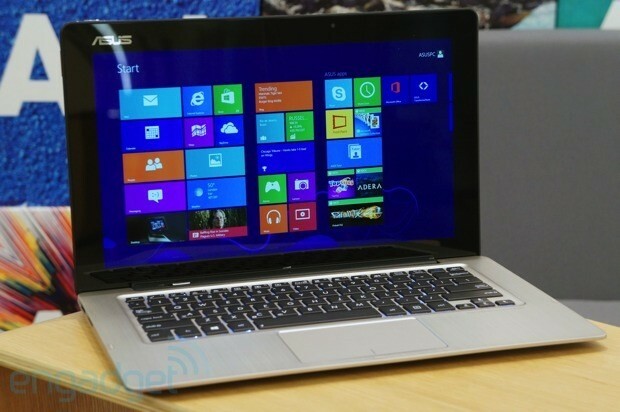 Whether ASUS made the buttons deeper or shallower is hard to tell: they feel about the same. All we know is that the keyboard offers more tactile feedback than most ultraportables, and that the buttons are bouncy and well-spaced enough that typos are unlikely (we're sure you can find a way, though). Seriously, when we think back to ASUS' first Ultrabook, where we had to mash the keys to make sure our presses registered, we're reminded of how far the company has come, at least in terms of typing experience. Today, ASUS' keyboards don't call much attention to themselves. And that's a good thing. Lingering on the keys for a moment, you'll find a few functions built into specific buttons. The space bar, for instance, has a control on the left end that activates the Power4Gear Hybrid application, where you can select different power management profiles. The "C" key doubles as a shortcut for ASUS' Splendid Video Technology dashboard, where you change the display settings to "Theater," "Vivid" or some manual configuration. (We left it on the default mode most of the time, because we're boring like that.) The "A" button contains an on / off switch for the ambient light sensor. 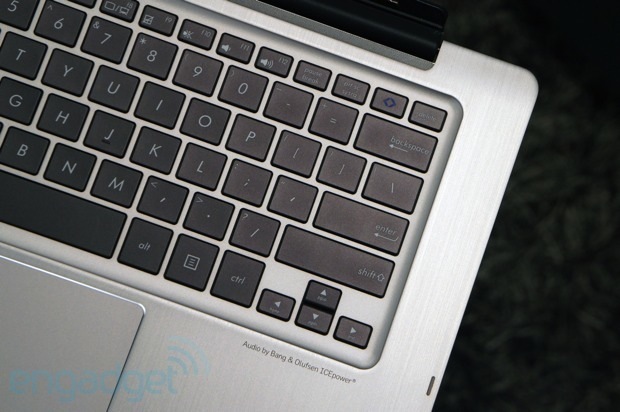 The "V" key, meanwhile, is where you'll find a shortcut for ASUS' Lifeframe camera app, which has all the photo filters, borders and emoticons you'd expect from a typical notebook webcam. The Function keys, of course, house all your requisite volume and brightness controls. In this case, you need to use the Fn key to activate them; that's either good news or bad news, depending on how much you rely on keyboard shortcuts. 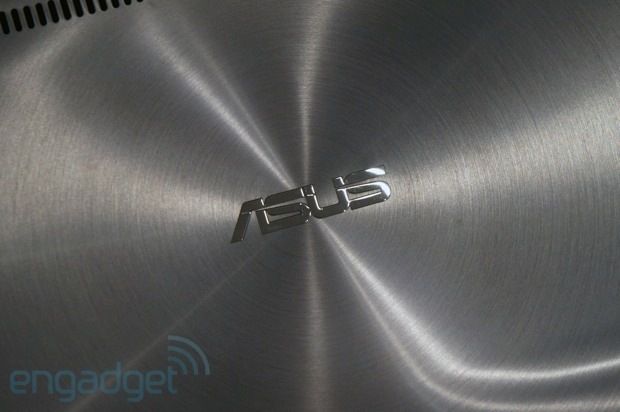 ASUS has come a long way with its trackpads too. 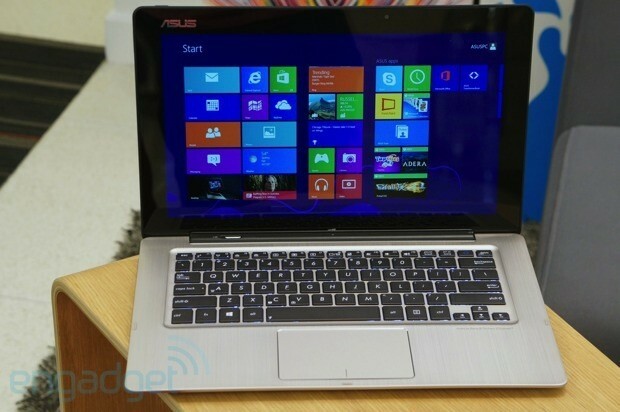 The one here, which uses ASUS' own drivers, isn't half-bad. We enjoyed smooth, controlled pinch-to-zooming in IE10, and didn't even have to apply much pressure with our fingers. Two-finger scrolls work well too. Even single-finger tracking is precise, which might be the number one thing we complain about when we test out laptop touchpads. If anything, the touch button is a bit stiff, but that's easy to let slide compared to some of the other issues we're used to. Those bezels aside, it's of typical ASUS quality, which is to say the colors are vivid and the viewing angles are wide, especially from the front with the lid pushed forward. Though the glossy finish tends to reflect light (as glossy finishes do), we were impressed by how the colors stayed vibrant even as we shifted our position to watch from off-kilter angles. Sure, all of that starts to fall apart as you move toward a 180-degree angle, but how many of you really watch Netflix out of your peripheral vision anyway? As it's been doing with its other Ultrabooks, ASUS went with a Bang & Olufsen ICEpower audio setup, with four speakers and MaxxAudio technology on the software side. So, the equation hasn't changed, and neither has our opinion: the machine pulls off some surprisingly not-tinny sound (relatively speaking) but the volume is low, even for a small laptop. We enjoyed listening to everything from The Clash to Ray Charles, but time and again, we kept hitting the volume-up button, only to be reminded we were already maxed out. Not a dealbreaker, obviously: that's why we have stuff like this. The Transformer Book runs off a 1.9GHz Core i7-3517U processor, the same one used in various Ultrabooks that went on sale last fall, like the Acer Aspire S7 and ASUS' own TAICHI 21. Additionally, it has 4GB of RAM, a 128GB SanDisk SSD and, of course, integrated Intel HD 4000 graphics. (What? You weren't expecting a discrete GPU, were you?) For whatever reason, its synthetic benchmark scores trail what we got from similarly specced machines (discounting the S7, even, because that has a faster RAID 0 setup). That said, we refuse to believe it's a slow machine, per se. In practical terms, it boots in six seconds, which might be the fastest start-up time we've logged yet on a Windows 8 device. Also, it resumes from sleep in under two, as advertised. What we're trying to say is: calling this a slow system would be a huge misnomer. If you're thinking it's the 500GB HDD dragging down the performance scores, rest assured that's not the case. First off, we got the same sort of numbers even when we ran our tests with the keyboard detached. Secondly, ASUS says the OS is installed on the 128GB solid-state drive and that the computer stores files there first by default, unless you tell it to do otherwise. In other words, you won't even start using it until you run out of space on the SSD. Really, then, it helps to think of the keyboard dock as a giant external hard drive; when you attach it, you even get the same Windows dialog box that you would if you inserted a thumb drive. ASUS wasn't kidding when it said the tablet's 5,000mAh battery could last five hours: our test unit ran exactly five hours and one minute in our rundown test (video looping, WiFi on). If you look at the comparison table above, you'll see that's about average for a touchscreen Ultrabook with an Ivy Bridge CPU -- the new Kirabook and the ASUS Zenbook Prime UX31A Touch both delivered pretty similar results. The best you could hope for on a device like this is maybe half an hour longer, but hopefully that'll change when Haswell becomes the new chip standard. For now, as we said, the keyboard dock has its own 3,120mAh battery, which promises to extend the runtime to up to eight hours. 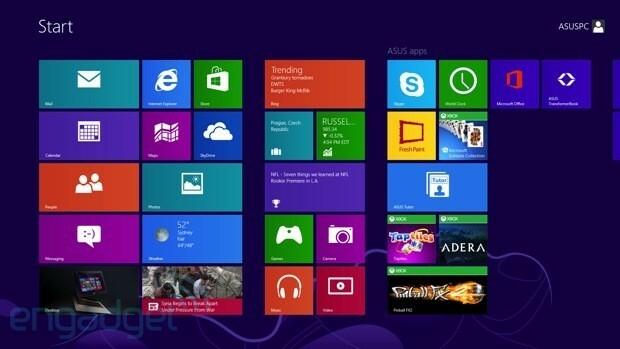 We have to say: we're digging this trend of PC makers putting less crapware on their systems. (None would be super, but we'll take what we can get.) On board, you'll find World Clock, Fresh Paint, Microsoft Solitaire Collection, ASUS Tutor and a few Xbox Live games, including Taptiles, Adera and Pinball FX. There's also that Power4Gear Hybrid power management software we mentioned earlier in the review. Oh, and you get 32GB of ASUS WebStorage, free for three years. After that time expires, you still get eight gigs free for life. In the event anything breaks, you've got one year of warranty coverage. Pretty standard for consumer PCs. When ASUS first announced the Transformer Book line a year ago, we were under the impression it would be available in 11-, 13- and 14-inch screen sizes. Evidently, someone high up in the pecking order decided that would be a bad idea, as the company is now selling just the 13-inch model, and in one configuration at that. In the US, you'll be able to get precisely the unit we reviewed today, a $1,499 machine with a Core i7 processor, 4GB of RAM and a 128GB SSD inside the tablet. Outside the US, a Core i5 version will be available in some regions. That one will have a 320GB HDD inside the keyboard dock, not a 500GB drive. It's getting a little tiresome ending all pre-Computex laptop reviews this way, but it's worth repeating nonetheless: unless your laptop dies a sudden death leaving you without a computer, you should wait until Intel launches its next-gen Haswell chips before making a purchase. We don't know everything there is to know about those processors yet, but we have been promised longer battery life and improved graphics performance which -- hello? -- is exactly what Ultrabooks need right now. Those are two very good reasons to wait, even if you're not particularly interested in clock speed, cores or Turbo Boost. 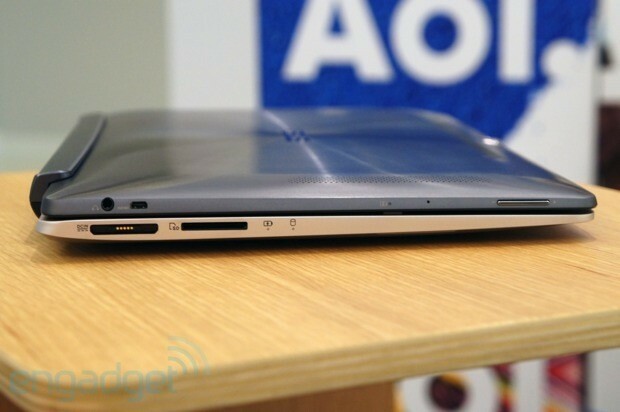 And besides, all of our current favorite Win 8 devices (the Dell XPS 12, the Lenovo Yoga 13, the Acer Iconia W700, etc.) are due for refreshes themselves, if not out-and-out redesigns. So sit back and see what's announced in Taiwan next month. If you'll allow us to talk up a couple true competitors, though, we'd encourage you to read up on HP's Split x2 hybrid, which arrives in August with a 13-inch display and a keyboard dock that includes both a spare battery and a 500GB hard drive. Unfortunately, this, too, will ship with Ivy Bridge processors, and its specs aren't a total match anyway (it'll have Core i3 and i5, with a lower-res 1,366 x 768 display). Still, with a starting price of $800 (dock included) it could be tempting for those who don't want to spend $1,499 on the Transformer Book. Finally, there's also the Lenovo ThinkPad Helix, an 11.6-inch machine with similar internals. Unfortunately, we haven't gotten a chance to review it yet, but here's hoping we rectify that soon. If you were willing to wait this long for the Transformer Book to go on sale, you may as well wait a few more months for a possible Haswell refresh: it would bring longer battery life and stronger graphics performance too. But is it worth holding out for at all? Depends on how badly you want a 13-inch standalone tablet. Though the dockable-tablet form factor makes sense for 11-inch systems, it becomes more niche-y when you expand the screen size to 13 inches. After all, tablets that big can be cumbersome to use, even when they're as thin and relatively light as the Transformer Book is. And this one doesn't have a Wacom digitizer, which rules out some scenarios where the slate form factor might come in handy. Meanwhile, convertible laptops like the Lenovo IdeaPad Yoga 13 and Dell XPS 12 weigh less in total, but still manage to offer roomy keyboards, hands-free tablet modes, slightly longer battery life and similarly fast (or faster) performance. Before you dismiss it, though, there are still some practical reasons to choose the Transformer Book over those other machines. Number one is that spare battery. Almost no convertible Ultrabooks allow you to use two batteries at once. And unfortunately, many current hybrids (the Surface, Acer Iconia W700) don't have a second battery in the keyboard. Likewise, it's extremely uncommon to find a spare hard drive inside the keyboard dock, and most Ultrabooks tend to top out at 256GB of solid-state storage. So if more space and extended battery life are important, the Transformer Book could be a good option -- even if you rarely end up using it as a tablet. Just take our advice and wait on Haswell.